David Fano will lead a special Revit workshop on February 17. 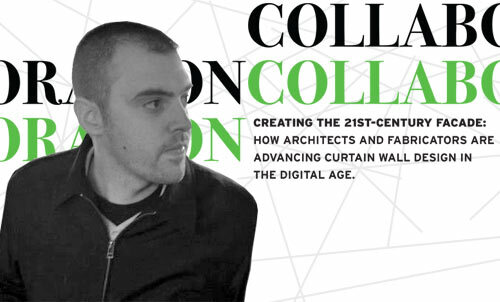 On February 17, David Fano will lead Revit Design, a workshop exploring the possibilities of the digital design program Revit, as part of DAY 2 of COLLABORATION, a conference on fabrication and facades sponsored by The Architect’s Newspaper. In 2008, David Fano established CASE Design, a Building Information Modeling (BIM) consultancy in New York. Prior to CASE, Fano was Director of Technology Research at SHoP Architects, where he managed technology R&D initiatives, worked with project teams to ensure the successful implementation of BIM, and developed “direct to fabrication” initiatives with software manufacturers and fabricators through the use of BIM. He contributed technology expertise on numerous projects, including for a 41-story rental tower in New York City and for The New Seaport, an 860,000-square-feet multi-use development in New York City’s Historic Seaport District. Since 2006, David has been an Adjunct Professor at Columbia University’s Graduate School of Architecture, Planning, and Preservation where he teaches seminars and workshops focusing on the impact of technology on design processes. David received his Master of Architecture with honors from Columbia University where he was the recipient of the Lucille Smyser Lowenfish Memorial Prize and the Computer Aided Design Honor Award. On February 17, David will present the day-long workshop, Revit Design, building from fundamental Revit design concepts to advanced techniques concentrating on how the formal and organizational potentials emerge from informational modeling. Register here.